Kyle King is all about playing Clemson in 2013. I am too, but I don't get why we're playing Clemson (2013/2014) and Oregon (2015, 2016) the same cycled home and home years as Georgia Tech. In other words, we're on the road at GT and Clemson in '13 and on the road at Oregon and GT in '15. That's the opposite of the way we've scheduled most of our other big OCC games since 2002 (Ok State aside). I'm also in agreement with Blutarsky that the idea of playing Clemson in a Spring exhibition would also be fun. I will add to his take that we already do this with Clemson in Basketball. 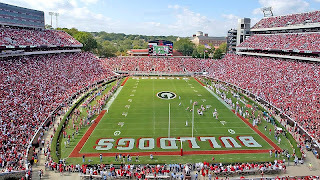 The NCAA allows for one closed scrimmage (no fans and no media) between schools per year, and UGA has elected to pair up with Clemson 3-4 times over the past few years. The match-ups started with Felton and Purnell as they were old friends, and it continued this year between Fox and Purnell. I see little value in playing Clemson more than one series per decade in football (regular season). Mainly because it benefits them more than us in terms of in state recruiting. However, I'd like to see us play them every year for the rest of eternity in basketball. The old football mentality of "Clemson is an enemy" helps fill seats for basketball. And seat filling regional games would be a huge asset to basketball. I also like the idea of playing Clemson every year in hoops. Glad we are playing them in football in 2013-14, should be great. Wait, a tradition you don't want to hearken back to? What's the world coming to? It's so very infrequent that you and TKyle disagree in print! My faith is shaken in the Bulldog nation's glorious blogospheric leaders! Next thing you know, one of you will make a power move and someone'll end up stuffed in an open casket in Butts-Mehre. Sooo what does this post have to do with spring break? To answer the home/away rotation question: because Damon Evans can't see the forest for the trees. All he has to do is look south to Gainesville to see that winning will make you a "national brand" quicker than suicidal scheduling. Ok State averaged 4.6 wins a year for over 15 years when we booked them. And we only booked them because we were desperate for a game. ASU is a typical 6-7 win team. Nothing suicidal about that. I wish we were scheduling them. Look at the huge boost that Ohio got a couple years ago for the back to back Texas scheduling. Didn't help them much the first year, but got them into the title game the next. We opened Oklahoma State's new stadium. We (read: Damon) chose to walk into a buzzsaw. The Falcons had a better chance against the Saints when they re-opened the Superdome. You're right that ASU is an average program, but when did we schedule them? Immediately after the longest possible SEC road trip (Fayetteville) and a home game against fellow SEC powerhouse LSU. Brilliant. My point is that in this day and age, the SEC has such a reputation that over-scheduling isn't necessary to win a national title. Florida plays nobody OOC and that hasn't seemed to hurt their national image. Winning in JAX + scheduling down = MNC's. It might not be suicidal scheduling, but those ASU and OK State games were a damn sight tougher than playing the Citadel. PWD, man I would love to make Clemson a permanent out of conference game; even if it mean't dragging Tech, kicking and screaming back into the SEC and waving by by to Ark or UK. The Clemson and Bulldog Nations deserve each other on a regular basis. Better yet lets bring Tech, Clemson and FSU into the SEC. These in state rivalries should count more than just bragging rights. The sad reality is that we are merely an average football program. It matters not who we schedule when, or even where we play said opponet. As Dawg fans we hammer teams like Clemson, Auburn and ND for living in the past. Truth be told, we live in the same past. I have come to realize that if it were not for the best college runningback/player ever, we would be South Carolina. Yes, some will bash me for this train of thought. But, if you allow yourself to ponder this topic, I assure you that you too will come to the same conclusion. We are simply not a big boy in college football, and probably never will be. Sad, but true. Hey Dufusdawg, we were the 3rd winningest program over the past decade in the touest conference in CFB. Won 2 SEC championships and played for another in that span. Finished #3 in 2002 and #2 in 2007in the nation. We're not Texas but we're a lot closer to them than we are to South Carolina. BC SAV...Great argument. You have some extremely valid points. However, your points do nothing to deminish my original topic: We are an average college football program. Dawgs are 3rd winningest SEC team in the past 10 years. That sounds great, looks good on paper, but being 3rd has not equated to additional national titles, nor droves of national respect. Florida and LSU are both better programs than we are. Tell 'Bama fans we have more wins than they do over a 10 year span. What is their response? How many NC do you have? When was the last time you play in a NC game? As for being closer to Texas than SC, you are simply wrong. Texas, much like UGA, struggled for a long stretch. The difference is that the Horns have now played in 2 NC games since 05, winning one. We have not sniffed a NC game since the early 80's. Take Herschel away from us, and what do we have left? Nothing! Utah and Auburn have both ended the season ranked #2. Great! What does that mean for either prorgam? Exactly what it means for our Dawgs: A bucket full of pride and increased ticket prices. My arguement in this case does not deminish my passion or pride for the Dawgs. I simply realized we are what we are. Have to disagree with you on the scheduling but I don't knock Damon. I thought it was great when it was done. 1) This scheduling philosophy was mainly conceived after us being shutout in 02 and Auburn being shutout in 04. 2) In the OOC games we scheduled, Boise, Colorado, OKST (H), ASU (A), OKST (A), ASU (H) we are 5-1. Not too bad. 3) However, in the immediately following SEC game we are 3-3. Of the three wins, one was an ugly win over SCe with DJ at QB, another was the "ugliest win of the Richt era" in Oxford, and the last was the shootout last year with SCe. The losses following those games were the 07 SCe loss that cost us a chance at the MNC, the embarassing Bama 08 game, and this past year's LSU game. 4) The SEC games following are easily all in the worst 20 performances of our 40 SEC games over the past 5 years. I would argue the only other SEC games that are on par with those performances were Vandy & UK 06, UT 07 and 09, UF 08 and 09. Of our worst 12 SEC performances in the last 5 years, 6 followed these road games. 2008: 12-1 or 11-2 with a competitive game against Bama and enough momentum to beat GTU. 2009: 10-3, beat a cupcake instead of OKST, a little bit extra beats LSU, who knows if the extra momentum then changes the UT or UK games and we end up 11-2 or 12-1. Again, if I were AD I would have done the exact same thing. I thought it was a great idea at the time. I was wrong. Also, the Oregon and Clemson series were scheduled back when I still thought they were a good idea. I hope the athletic department knows this too. Also, the Oregon and Clemson series were scheduled back when I still thought they were a good idea. It took Bama 08, OKST 09, and ASU/LSU 09 to convince me. 1) The possibility of us getting shutout in 05 had we run the table instead of getting shutout in 02. 4)Last sentence should read these OOC games and not road games. Waving by by to UK?